This is the first game in the Etrian Odyssey series. For other games in the series see the Etrian Odyssey category. 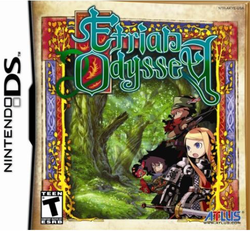 Etrian Odyssey, released in Japan as Yggdrasil Labyrinth (世界樹の迷宮, Sekaiju no Meikyū), is a 3D turn based dungeon crawler role-playing game by Atlus for the Nintendo DS. It was released on January 18, 2007 in Japan, May 15, 2007 in North America, and June 6, 2008 in Europe. Drawing comparisons to titles such as Wizardry and The Bard's Tale, Etrian Odyssey challenges players with exploring and mapping a vast dungeon. In classic fashion, players navigate through the dungeon a single "step" at a time, moving and turning in fixed increments. Time passes only when an action is taken, causing movement, random encounters, and combat to all be entirely turn-based. The game uses a first-person view to present the dungeon using a combination of relatively simple 3D computer graphics for environments and single-frame 2D sprites for enemies. As in the era prior to the inclusion of automatic mapping in the genre, Etrian Odyssey requires that players maintain their own map. However, rather than doing so on a separate sheet of graph paper, players do this by directly annotating (with the stylus) a small map displayed on the DS' touchscreen. The accuracy of the map is entirely controlled by the player, so he or she is free to map accurately or haphazardly. However, since the ability to successfully navigate back out of the dungeon (in order to save the game by returning to town) relies on keeping an accurate map, doing so is highly advantageous. This page was last edited on 26 February 2014, at 19:27. This page has been accessed 14,233 times.